So even faux-speakeasies can't avoid Johnny Law! CH Projects (Ironside Fish & Oyster, Soda & Swine, Neighborhood) newest concept False Idol, a tiki-themed speakeasy accessible through a freezer door inside Little Italy's Craft & Commerce, has been closed by the San Diego Fire Marshall. 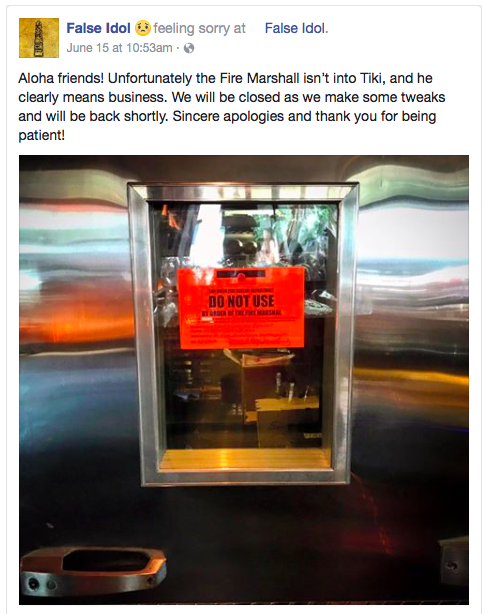 Yesterday, CH Projects took to Facebook to announce that the fire marshall closed False Idol. We visited the location over the recent Memorial Day weekend and truly enjoyed the concept, although the thunder-and-lightning sounds with every punch bowl ordered quickly got annoying. Hopefully they remedy that issue during their closure, or, perhaps, play this critique in the bathrooms like they do with their negative Yelp reviews. False Idol opened in September 2016 after CH Projects closed for a nearly-one-year renovation of its popular Craft & Commerce concept. 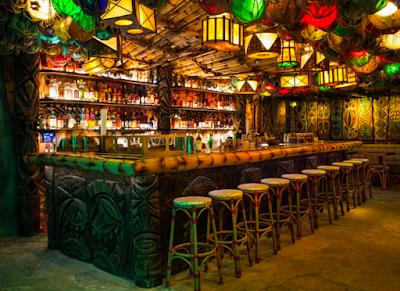 CH Projects partnered with bar owner, educator and author, Martin Cate, to launch False Idol - a Polynesian pop inspired tiki temple accessed through an unassuming secret entrance within Craft & Commerce. False Idol hopes to reopen as soon as possibly, aiming for as early as next week. For more information, visit falseidoltiki.com.